Looking at the above photo you’d be excused for being confused by the name of this café. 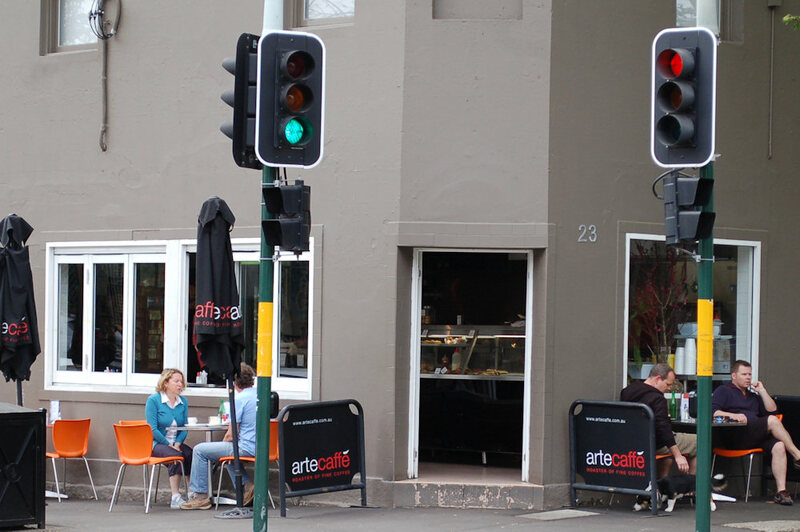 Now named Sydney Fine Food Company Café, it sits on the corners of Buckland and Wyndham Streets. Seating is limited both inside and out but despite it being busy throughout our visit, there always seemed to be people coming and going so grabbing a table shouldn’t be a problem. We seated ourselves and were served promptly (in part for our waitress’ fondness for our Daschund). We browsed the café inside, admiring the large variety of rolls, wraps, cookies, cakes and brownies on display. Some of the Company’s jams are available for sale as well. 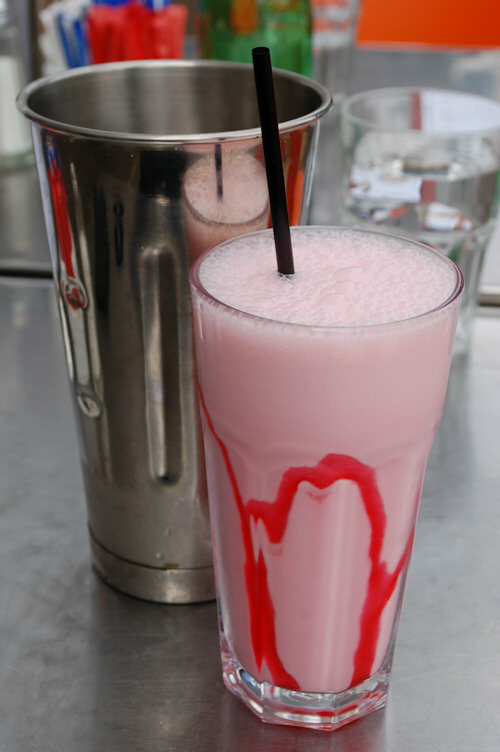 The waitress apologised for the strawberry milkshake’s ($5) lack of real strawberries – they were out today. I had originally ordered a smoothie ($6) which became a milkshake due to the absence of fruit. I’m not picky so this wasn’t a problem however I would have expected a café to have fresh fruit early in the morning for its menu items that require it. 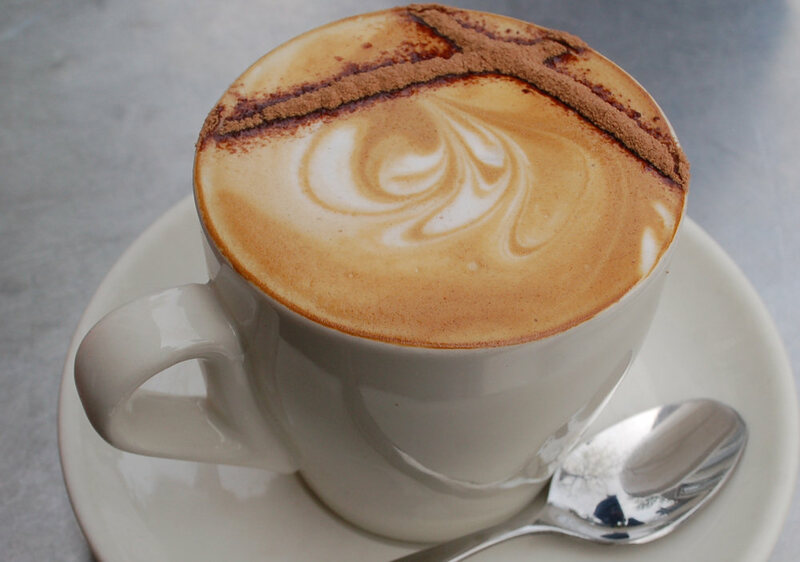 The skim cappuccino ($3.20) was beautifully presented with flavour that almost matched. Despite satisfying this guest, she was expecting more. 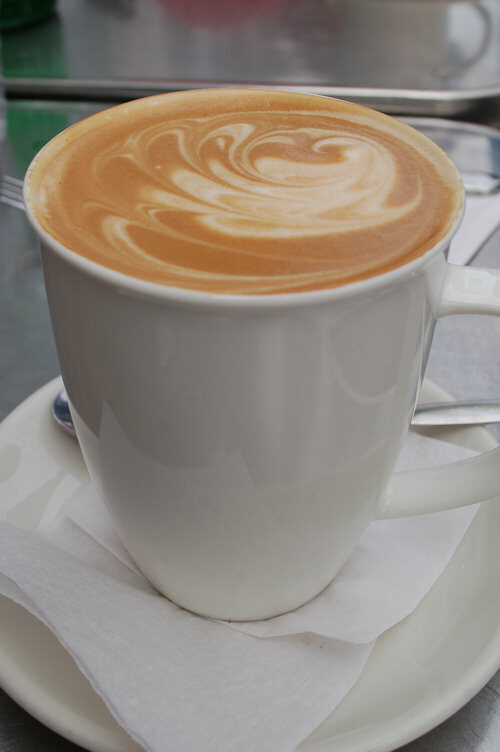 The large skim flat whites ($3.70) were not as hot as we would have hoped for. We ordered more later which we enjoyed simply because they were served very hot and didn’t become room temperature by the time we reached the bottom. 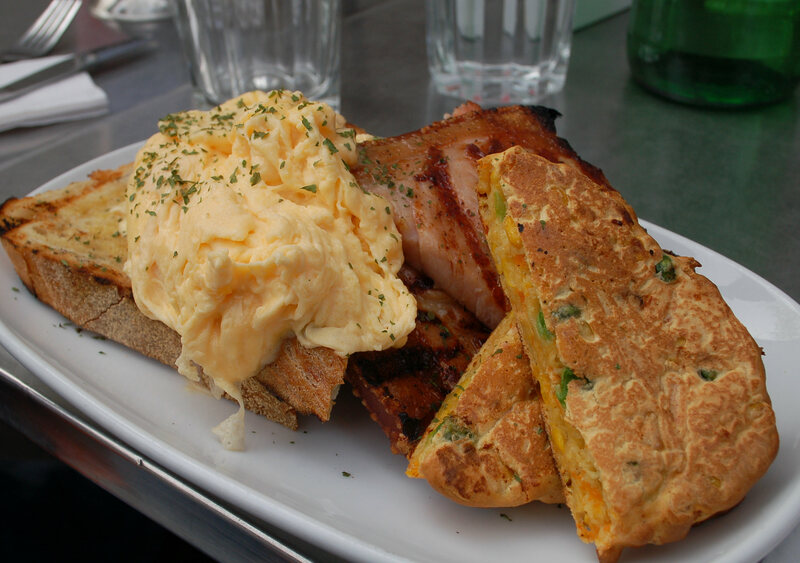 The Site Breaky ($15.90) is a dish that deserves a bigger plate. As it is though, it serves as a meal with some delightful surprises underneath. What you can see above are the eggs (served any way), corn fritters and SFFC’s unique and signature thick cut bacon (more on that later). The corn fritters tasted good with plenty of herbs to compliment the corn however they were too dry and would have benefitted with a sauce (perhaps the cherry tomato salsa from the veggi fritters ($13.50). Hiding beneath the bacon was a generous amount of delicious chorizo and tomato, the latter of which has been roasted for a long time but still tasted fantastic. If you’re hungry and want some variety, this is the dish for you. The baked eggs with tomato, chilli chickpeas and mozzarella ($13) was a delight. 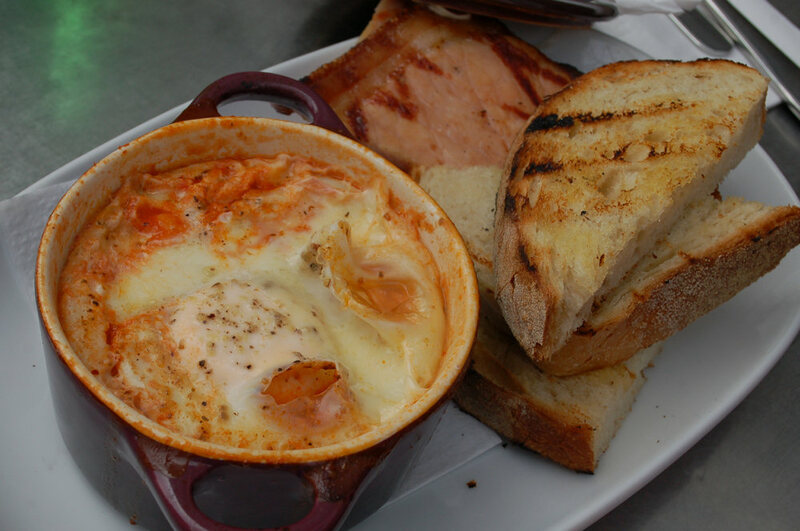 Served piping hot in a bowl, the spice of this baked eggs will definitely wake you up and it was great to find a café not afraid to embrace some spice. The chickpeas add a great crunchy texture and you simply can’t go wrong adding stringy mozzarella to baked eggs. More ingenuity points to SFFC for their toast which had been grilled with a slight charring. 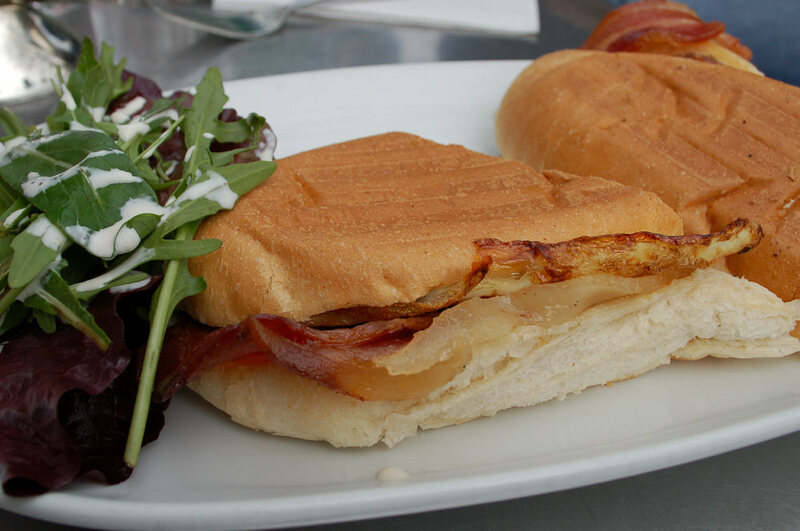 We added some of the thick cut bacon as a side to this dish which we recommend you do too no matter what you order! Fans of bacon in its kassler or gammon form will not be able to get enough of the thick, smoky, rind-on bacon you can order here. One of my guests ordered a bacon and egg roll ($?) from the glass counter which despite enjoying, he somewhat regretted after tasing the other meals. The roll and ingredients in their re-heated form lacked the flavour and freshness the rest of us enjoyed but if you’re after some take away, this would be a good choice. If you’re dining in and want to order this, ask for it to be made fresh with the thick cut bacon. 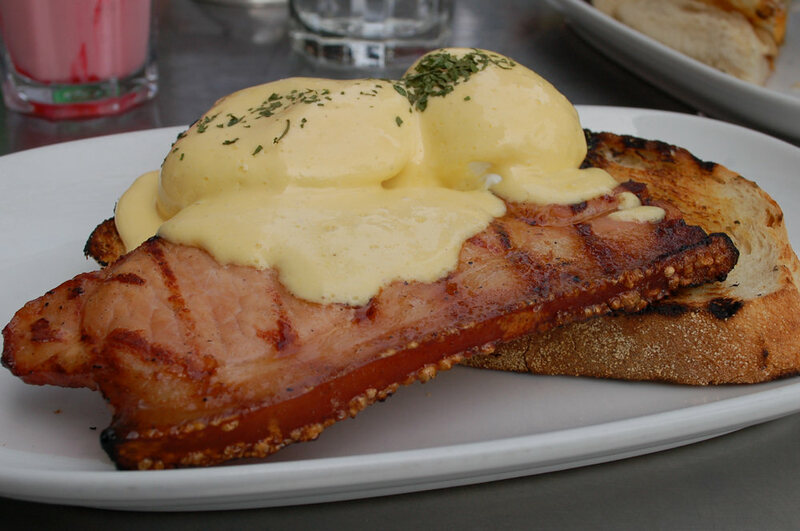 The eggs Benedict ($13.90) is made even better when topped with the succulent bacon and served on more of the charred toast. The eggs were prepared perfectly and I was very close to ordering a second serving. Some salad on the side would compliment well and add some size to the meal. Sydney Fine Food Company Café is a hit amongst the locals. I removed some ‘service’ points from the score because of the length of time we waited for our food. This was perhaps done in haste as this was likely due to the length of time to cook the thicker bacon and baked eggs. Despite this, I can highly recommend SFFC as a relaxed establishment with some gems on the menu. Free WiFi is available and free picnic rugs are offered to use in the park across the road. On a warm weekend can you think of a better way to pass a few hours while enjoying some fantastic food? interesting! I never ate there when we lived there, but their take away coffee was always great to take over to the park! Generally supplemented by one of their ‘to die for’ muffins which are freshly baked early in the morning and still warm when I used to get there!! I wasn’t sure that the eat in would be that great as I see it more of a transient cafe, but that Bacon does look good! It is a shame that the people who run this cafe have such a fundamental misunderstanding of service because the coffee is pretty good and my girlfriend and I live a block away. For a time now (because I have been recovering from surgery) I have been going there almost every day for a coffee and a sandwich (sometimes a juice too) because I am working from home. I always forget to bring my loyalty stamp card … don’t we all? And I noticed that they have space next to their cash register where some customers have their cards pinned up. When I asked if mine could be put up, the response from the young woman was “No. We’re running out of room.” Really?! Not: “we’re out of room” which would probably have still been a bit off-putting, but “running out” … like there were future customers who she could predict would be more important that me and my girlfriend. The response to the “problem” of having too many loyal customers who want to leave their cards with you due to their constantly spending money at your establishment is to find a place where there is MORE room, not reject people who provide you your business. This particular young woman has been rather rude throughout my entire experiences at the cafe (and there have been many) but this was the last straw. I would encourage everyone to patronise any of the other wonderful cafes in the area instead of supporting these people (Bitton and Ragland are probably the very best but there are many) and please excuse the fact that you might see this review duplicated on other “review” websites as I will be posting it to all that are available.